I am grateful for what all you have done for me. I would be glad if you all grow deeper into Sahajayoga. Many of you are good Sahajis. At the very out set we have to know that truth is what it is. We cannot change it, we cannot conceptualise it, at this human state. 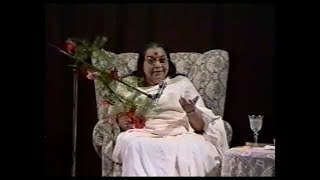 Advice Given By H. H. Shri Mataji, Gudi Padwa, March 24, 1993, New Delhi, India. Today is the first day of Satya Yuga (Age of truth). 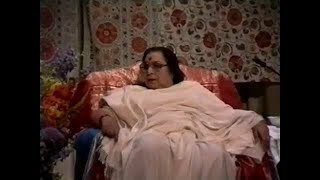 Shri Mataji: No, I mean we Indians have too much of sun in our body. So we perspire a lot compared to you people. Journalist: and your next stop from here is where? 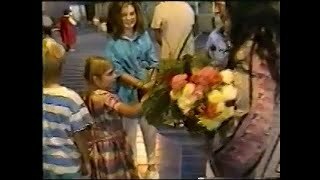 Shri Mataji: I think we are going to Brisbane. ALL THE SECTS ARE DANGEROUS. The Indians call her ‘The Great Mother’ and see her as a saint; At a very young age she used to write Mahatma Gandhi’s prayers. She’s been living in London since 1975 where her husband is general secretary of IMCO. She has founded yoga centers in India and in several countries in Europe : England, Switzerland, France, Italy. Interviewer: Please, explain the difference between East and West, what can India bring to the west…? *When you give joy to someone. The source of joy has to be beyond joy. * I am the giver of knowledge. * Without the light of “Atma” without the light of the ‘Spirit’ how can you know anything? So we have made it short now, just take a ‘bandhan’, it is he same thing as Kavacha you see. Realised souls, if they take bandhan is the same thing. Whatever you have said here is done, yesterdays and todays, everything that has been said, all these Raksha Kari is done in one stroke. The aim was to talk to Shri Mataji Nirmala Devi about her forthcoming North American tour. What happened was something that is only now, a week later, starting to make sense. Honourable guests, who have graced the occasion of my elder sister’s 60th birthday, my younger brothers and sisters and Sahaja Yogi brothers and sisters. This evening, I consider myself fortunate for getting this opportunity of saying a few words about Nirootai. We call her Nirootai* whom you know as Mataji Nirmala Devi. The programs which you have arranged at Baneshwar will certainly be very successful. Our attention is there. All God’s work will now have a new dynamism. Sahaja Yogis of Pune have given fulfilment to the ‘Punya’ of Pune. There is nothing special of mine in it. Whatever is with you has been discovered by you and accepted. This is the source of joy. It must be mentioned that Sahaja Yoga is not for curing people but for achieving Self-realization. Thus as a by-product one gets physical, mental and spiritual well-being in totality. The Spirit is reflected in the heart but the seat is above the fontanelle bone area. I do everything in collective consciousness. If I cure one person, many such cases become alright automatically. Sahaja Yogi parents have great responsibility towards their realised children. They have to be protected, disciplined and brought up in proper atmosphere of love. Realised children cannot tolerate negativity. They fight with it. I have received letters from all of you but have not been able to write because now in London Sahaja Yoga work has started with great drive. Whatever’s going on in the mind will affect the child—the mind has to be happy— you cannot be with artificiality or fantasy. 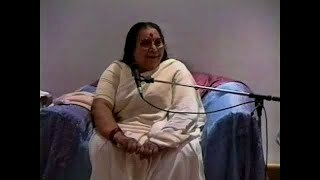 In today’s talk I will dwell on the essence of Sahaja Yoga. I am sure that it has been explained to you before. Besides, most of you are from Sahaja Yoga itself. So I need not go into details. 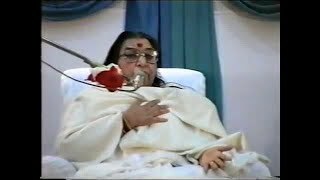 Shri Mataji: “You must remind me to return your money else I will have to repay it in the next life”. Kay: “That’s fine by me, Mother”. I want to be smaller, Like a dust particle.